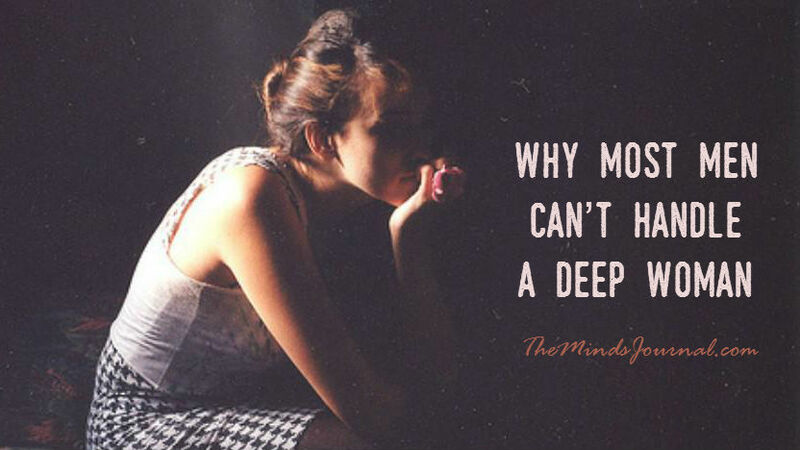 The deeper you are, the harder it becomes for you to find someone who wants to have a relationships with you. I liked the concept that you were trying to convey, but I think it could have been executed better. I think it should have been written with less of a target on genders by using general terms such as “individuals” or “they/their”, as it is commonly known that humans no matter what gender are multifaceted creatures. Different people like different people. The general tone of the article sounded like it was boasting the qualities of a CONFIDENT woman rather than giving insight into the world of a deep woman. I believe it’s true that people who crave deep, intimate bonds and indulge in introspection and philosophy have a harder time forming romantic relationships and the reasons given were fair; but it could have been expanded in a much more insightful, non-egocentric way. your are absolutely right. Targeting a particular gender is something wrong in the article. There is no need of a rocket science to understand that all men are not same. You can find even a deep man who suffers a lot to get a perfect partner. Most of the things covered in the article also go with my personality but for a matter of fact I am an introvert too. And of course these are the reasons that I am difficult to accept most of the girls as my life partner. I do prefer mental openness than physical. It do not get biased, I do not fear to take a stand and present my views. So, as per my experience, yes, anyone who is deep suffers a lot to find a perfect mate but also knows how to handle the imperfection in anyone of them. You make it sound as if men have a duty to women to make their relationships perfect. I’ve never heard of any perfect relationship between any two people, ever. Men have wised up to the fact that “strong women” only want to take from men, and have men cater to their every whim, and then when they’re bored, blame the man who has tried to make her life “perfect” for their own boredom. What follows is him being blindsided with spurious restraining orders, abuse claims, having his life destroyed and his wages garnished all because the woman he tried to make happy got bored. Women aren’t finding relationships easy to come by because they have made relationships a lifetime burden for men, and men aren’t interested in putting up with it. You make deep women sound like insufferably pompous bores. I shall continue to give them a wide berth. Joie de vivre, compassion, and faithfulness are what I hope to find in a woman. It takes all sorts I suppose. Good luck in you quest for happiness, or should that be self-actualisation.